Slouchy in shape, supple lambskin, and a signature bottom–snap pocket are just some of the qualities you’ll find in a Zefanya bag. We were instantly taken with the uniquely fashioned new line, so we had a chat with the designer to learn more about her debut collection. Hauteness: Tell us about the name ‘Zefanya’. Zefanya: ‘Zefanya’ is my first name (Zefanya Yenny Widjaja). 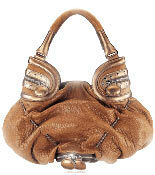 H: How did you initially become interested in handbag design? Do you have a design background? Z: I used to live in Europe and went to school in Paris for fashion design. During my studies, I learned the high quality craftsmanship as an apprentice to a chapelier in Paris. I also worked side by side with Monsieur Lessage in embroidery – he is the embroiderer for the haute couture collections of Chanel, Dior and other major couture houses. It was an amazing learning experience! I see the handbag as one of the ultimate accessories – it can change the look of an outfit, and as a rather large accessory it gives me the possibility to tell a story from its shape, material, and details. H: Do you design all the bags yourself? Z: Yes. I usually start making the shape of my bags with clay in miniature, like sculpting. It gives me a 3–D vision of the shape, and at the same time, I really enjoy the process of molding a shape. For now, the company is still small enough where it allows myself to be involved in the full process, from designing and sourcing materials, to supervising the production at the factory. I design here in my studio in New York and travel overseas to oversee the production process. I always check the finished bag before it is shipped off to my customers. H: What is the inspiration behind the Zefanya collection? Z: I take inspiration from different cultures, people and their lifestyles. Even though the world is becoming more global, it is great to see that there are still some original characteristics from one place to another, from people to their cultures and their history. I love to translate that into my designing of the Zefanya collection. H: What materials comprise your collection? 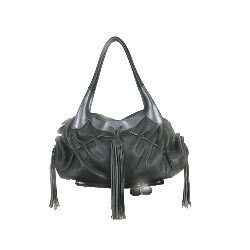 Z: Buttery soft Italian lambskin and luxurious soft cowhide. 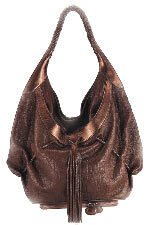 I also enjoy mixing materials such as cashmere and leather for great structure and strong colors. H: What are your design influences? Z: Any element that catches my attention; anything strong enough to give me an idea to create a bag that is beautiful and functional. H: Where did you come up with the bag names? Z:This collection is taken from voyages I had in the past and places I have lived. This collection is inspired by the trips I had last year across America – I visited 11 cities in 30 days. I designed a clutch with an attached mirror and named it Vegas, because a clutch is a perfect accessory to party. I also took inspiration from other places I visited a few years ago, like ‘Fez’ and ‘Cairo, with tassels representing the draperies and tents I saw there. The ‘Sharpei’ is inspired by a dog I met when I traveled in China – the side zippers show its slanted eyes and the bottom pocket shows it’s jaw. H: What inspired you to come up with the idea for the signature bottom snap compartment? Z: The first idea came up for the ‘New York’ bag. When I designed the ‘New York’, I was thinking of the urban lifestyle and how great it is to have a bag with a lot of pockets. The natural way of adding pockets to the bag made me think, “Where else could there be a functional pocket?” I added an extra compartment on the bottom that functions as an additional purse where you can keep your Metrocard, or just have easy access for paper and a pen (you know the feeling when you are scrambling through your bag for a piece of paper and a pen). I really loved the idea and the function of the bottom compartment so I incorporated that in several styles in my collection. H: What are some of the challenges you have faced with the launch of your line? Z: Challenge is constant – it is part of the design process as well as the motivation to constantly refine ideas and grow. I don’t see challenge as something ‘bad’, it motivates me and inspires me to think in different ways. I design not only for the U.S. market but for other markets, such as Asia. Different perceptions of beauty and different lifestyles can be challenging but at the same time it makes me understand more about different markets and I learn to appreciate the differences. H: What is your vision for the Zefanya brand? Z: As a lifestyle brand, I want to supply innovative design and want customers to rely on the good quality of a Zefanya handbag. H: Who is the Zefanya woman/customer? What appeals to her, in terms of fashion? Z: I see someone who likes to try new things and has her own individual style. H: Who would you love to see carrying Zefanya? Z: Women of all races and all ages, interpreting the Zefanya style their own way. H: Where will you draw continued inspiration for future collections? Z: That is a constant work in progress! H: Which bag is your favorite? Z: Right now, I wear either the ‘Mumbai’ or ‘New York’. But whenever I need to take my laptop, I will also bring the ‘London’ bag. H: Where can customers purchase your bags? Do you have an online shop? Z: Customers can log on to www.zefanya.com to find the nearest retail stores and can also purchase through us directly. 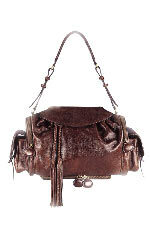 Zefanya is giving Hauteness readers 25% off all handbags in their debut collection. Head on over to Zefanya.com, select the bags you want to purchase, and email info@zefanya.com, mentioning that you saw this offer on Hauteness – The Handbag Magazine! (Offer expires December 31, 2006).